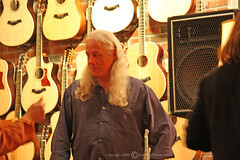 Ed Gerhard, extraordinary guitarist, during intermission at his concert at The Music Emporium in Lexington, MA, 10/11/2008. A fabulous show. My sister, our friend, Eileen, and I (the self-proclaimed "Ed Heads") were all in attendance. BTW, on the right is the back of Ed's lovely wife, Kelli. Ed will be performing in March, 2009, at the Regent Theatre in Arlington as part of a fundraiser for Raising the Blues, a group that helps the patients at the Shriner's Burn Centers by getting music to them. Please check out Ed's site to find out when he'll be playing near you.